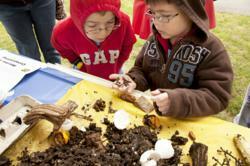 Families will enjoy an afternoon of science, nature, and fun at Hagley Museum and Library's 2013 NatureFest on May 4. Hagley and its community partners will have earth-themed, hands-on activities for children. "Youngsters will enjoy a day of adventure from searching for signs of spring on nature walks to exploring a kid-sized ant hill," says museum educator Ruth Lonvick. "We want to encourage a passion for nature." Hagley Museum and Library presents NatureFest on Saturday, May 4, 10 a.m. to 3 p.m. NatureFest’s 2013 theme is Earth. This family event provides a fun learning opportunity for kids and encourages them to explore our environment. Admission is $5 for children six to fourteen, free for members, adults, and children five and under. Use Hagley’s Buck Road Entrance off Route 100. This outdoor event is held rain or shine, so dress appropriately. Play and learn with exciting “Earth-themed” hands-on activities brought to you by local community partners. While learning how ant societies function, kids can pretend to be an “ant for the day” at the giant ant hill which is new this year at NatureFest. Search for signs of spring on guided nature walks as the early du Pont family did each year. Hagley’s knowledgeable gardens and grounds staff will give tours of E.I. du Pont’s formal French Garden and the Eleutherian Mills Greenhouses. Kids will be able to adventurously scale an oak tree using a climbing harness. Many other activities and crafts will be offered. Please note that nature hikes are not suitable for strollers or people with difficulty walking. Additional hands-on activities, experiments, and displays will be provided by our community partners. Local business EZ Compost will be on site discussing food waste composting. Delaware Museum of Natural History will have an insect table – complete with a cockroach colony! At the Center for Creative Arts table, young visitors can mold air dry clay for an artistic, earth-related take-away. Hagley thanks all its community partners for their support: Delaware Section of the American Chemical Society, Delaware Museum of Natural History, EZ Compost, Girl Scouts of the USA, Master Gardener Hetty Franke, and Center for Creative Arts. The Belin House Organic Café will be selling a selection of family-friendly outdoor favorites. Highlights of the menu include hamburgers, hotdogs, and Portobello mushroom burgers, fruit salad, blueberry lemonade, and more. At Hagley, we invite people of all ages to investigate and experience the unfolding history of American business, technology, and innovation, and its impact on the world, from our home at the historic DuPont powder yards on the banks of the Brandywine. For more information, call 302-685-2400 weekdays or visit http://www.hagley.org.